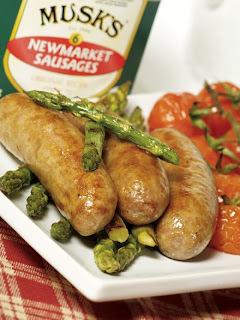 Nowadays the sausages are made in Newmarket to Elizabeth and James' secret recipe by Musks Limited at a clean, modern factory with A Grade BRC accreditation They still feature heavily on the breakfast tables of Royalty, around Newmarket and much of England. Musk’s eponymous sausages are renown all over the world. Musks Limited exclusively owns the secret recipe and rights to the Musk’s name. 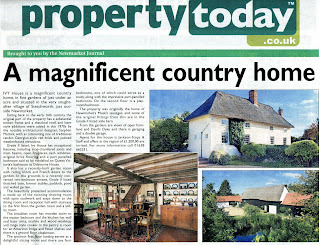 Ivy House Farm is now a private residence and the lands around it that were park of the pig farm have either been developed into housing or absorbed into the Duke of Sutherland's Stetchworth Park Estate Farm. Musk’s former Newmarket shop has become a branch of the Nationwide Building Society with the decorative frontage still intact and a blue plaque commemorating its former life! James Musk was born as the third child of this marriage on the 5th of August 1860 in Newmarket (his father's occupation is given as "Groom") and by the time he was 20 he was living (1881 census) in Chiswick, London, living as a boarder and working as a Butcher. Fairly adventurous for the 1880s. 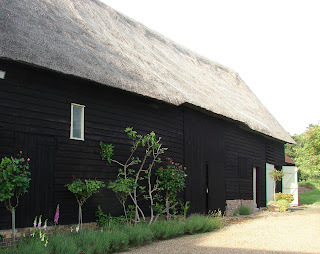 James next appears wh en he marries the widow Elizabeth Drake, 10 years his senior, in Depford in Kent (why did they get married there? A real mystery). She was well off and in 1883 Kelly's directory show her owning two Butcher's shops, one in High street Stetchworth, probably Ivy House, and the other in Market Street, Newmarket. 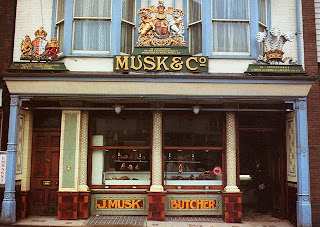 The Butchers rapidly became re-named as Musks and James is given as the owner of the Market Street Shop in 1888 and Market Row in 1905 (this may be a street name confusion). 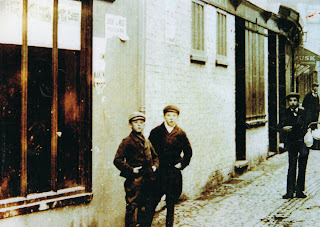 The picture on the left is a photograph of Market Street in Newmarket from the mid 1880s of two likely local boys and shows Musks Butchers shop in the background. 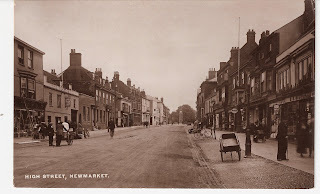 The business was very successful and by the time he got his first Royal Warrant he had establish a shop (see picture on right) on the H igh Street in Newmarket that was to trade as Musks until 1979. The Musks became very wealthy and pillars of the community. James was buried in Dullingham church where he had become an important member of the congregation (his grave is very close to the church door - a sure sign of his high status) and close to his parents. Jim dies on 13 December 1905 aged 45 at Ivy House in Stetchworth. He must have been a very popular and important person in the area as the local newspaper report gives a long and detailed report of his funeral. There were so many mourners that not everyone could get into the church. According to his will James died a very rich man and left money to his whole family including all his step children. His oldest step-son Louis Frederick Drake took over the business which then became James Musk & Co. When he died the business passed onto his step-son Louis Gilbert Drake and onwars through his family.